Last time you were around Thanksgiving dinner and you had to go around the table and say what you’re thankful for, did you say “a chance to go to school and get an education”? If you did say that, did you really mean it? For refugees who attend the Utah Dream Center’s Open Door reading classes, anyone can see that they mean it. The Center has a number of different programs that are designed for the benefit of people who are living on the west side of Salt Lake. Some of these programs are: Open Door, an after-school reading tutor program; SierraAlta Bible College; Arts Academy; Urban Flow, a multicultural dance class; and a clothing outreach program. Most of the programs that are offered at the Dream Center are free and open to the public. The Dream Center works with refugees who come from all over the world. Volunteers from the Dream Center will go recruiting by knocking on doors of the apartments near the Center and inviting residents to participate in the activities. The Dream Center focuses on a faith in Christ to effect change in the community. Its website states, “Jesus Christ’s transforming power compels us to emphasize compassion, hope and restoration in each of our programs.” The Dream Center, however, deals with immigrants from all over the world, some from areas with state religions. Metzger directs the Open Door program. It meets every Monday for reading or math tutoring. Metzger says anyone is allowed to come and receive free tutoring. A Dream Center volunteer will either help a child with their math or reading homework, or will read a book with them. “It’s loosely structured at the beginning,” Metzger said. “So when the kids show up we’ll play with them and hang out, build relationships.” After the building relationships portion, the students will split up into two groups according to their age. These groups will rotate between reading or homework and doing crafts. Volunteers for the Open Door program found Niwenshupi by knocking on her door. She is from Zambia, and is very grateful for the opportunity she now has to attend school. Niwenshupi said that in Zambia, “it’s really hard because your parents have to pay money, and in Africa, that is hard because they don’t have jobs. Sometimes it’s hard for parents to pay for their students.” If parents, like hers, can’t afford to send their kids to school, they are never able to go. Niwenshupi said the Center offers a lot of fun activities. “It’s a good place to be on Mondays,” she said. View images of RSVP volunteers in action at the Kearns Food Pantry. Ann Mayne moved to Salt Lake City from Texas in 1991 to be closer to her son after her husband died. The change was difficult for her, and adjusting to a new community with no friends and little family made her feel helpless. At age 60, she was uncertain of what her future would be like now that she was alone. “One morning I woke up and I said ‘What am I going to do with the rest of my life?’ I had no roots here, no sense of belonging,” she said. Mayne’s life changed later that year after seeing a flyer for the Retired and Senior Volunteer Program (RSVP) at her local library. RSVP is part of one of the largest volunteer programs offered to those 55 years and older and is sponsored through the Salt Lake County Aging Services. After contacting the program, she was put in touch with the Utah Cancer Society, where she volunteered her time as a record taker and became actively involved working in other community partnerships. For seniors like Mayne, RSVP is an opportunity for them to donate their time to serving the needs of the community. Tutoring, providing meals for the elderly and involvement in environmental awareness programs are some of the many activities volunteers participate in through RSVP. According to the Corporation for National and Community Service, RSVP significantly increases public support for organizations and increases the number of clients served in the organization. In return, volunteers benefit from the socialization with those whom they interact and gain a sense of belonging for contributing their time. RSVP began in 1971 as part of a national network of community service programs called Senior Corps. Its mission is to provide volunteer opportunities for the aging community to use their talents and skills to help out their local community. RSVP has been a major success nationwide and in 2006, there were around 480,000 volunteers nationally who donated 66 million hours of their time in their local communities through the program. Salt Lake County Aging Services has sponsored the program since 1974. There are currently 1,150 active volunteers whose ages range from 55 to 99. Last year alone, more than 200,000 hours of volunteer service were contributed to 70 community organizations, such as the University of Utah Hospital, local school districts and art museums. Collecting diverse agencies and programs is what Hansen aims to provide to guarantee volunteers are placed in an organization where they feel comfortable and confident to volunteer in. At the Kearns Food Pantry, most of the workers are RSVP volunteers. A total of 14 RSVP volunteers are active at the pantry, many who have been there for several years. Last month, the pantry fed about 2,900 needy people and volunteers donated 350 hours of their time. Loretta Mann, 77, became an RSVP volunteer for the pantry two years ago after she noticed an advertisement for the program at her local library. After retiring from her job at a local bank, she decided volunteering would be a great opportunity to spend her free time and engage with others in her community. Mann donates eight hours of her time each week at the Kearns Food Pantry with other volunteers whom she considers her family. She sorts and distributes food alongside with other RSVP volunteers, who have given meaning to her life . 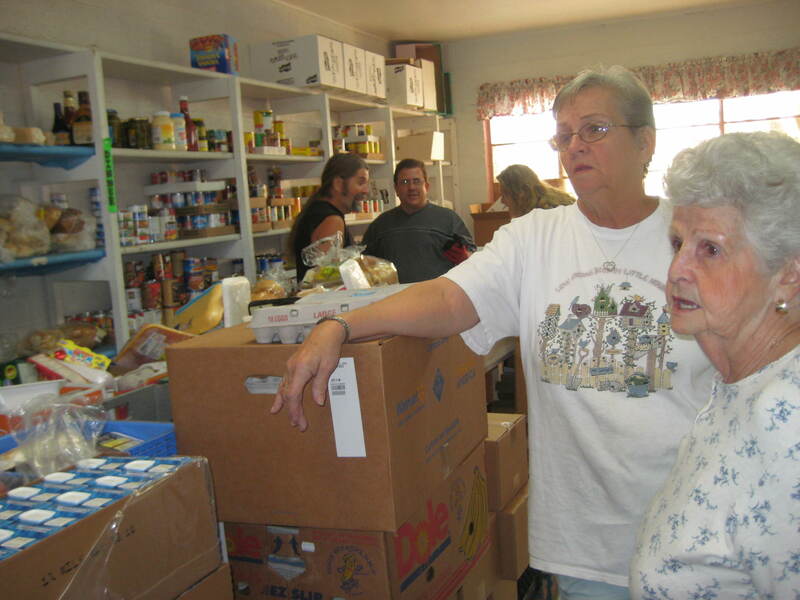 Loretta Mann, right, participates with other RSVP volunteers at the Kearns Food Pantry. For the future of the RSVP program, Hansen hopes to see the amount of volunteers increase and become involved as the Baby Boomer generation retires. The benefits she says, will not only strengthen the community, but also strengthen the confidence of the volunteer and unlock the hidden talents they may have never discovered. Human trafficking usually starts with despair and a desire for something better and often ends in tragedy. Human trafficking is the act of illegally transporting victims for slavery from one country to another. It has become increasingly common around the world. Human trafficking is a multi-billion-dollar industry that relies on hopelessness and unawareness as a means of luring individuals and families to be tricked and sold into slavery. Deborah Bulkeley, a reporter with the Deseret News who has written several articles on human trafficking in Utah, said the majority of victims are women who are usually forced into prostitution. “These women work just as any other prostitute would but do not receive any compensation for what they do, but rather get abused and suffer for their work,” Bulkeley said. It is estimated that more than 12 million people are victims of human trafficking; 80 percent are female and 50 percent are under the age of 18, according to the End Human Trafficking Web site. Between 600,000 and 800,000 victims are trafficked across international borders every year and the numbers continue to increase. Utah’s legislature is now stepping up to the challenge of combating human trafficking locally as well as nationally. In 2006, The U.S. Department of Justice announced that Salt Lake City would receive $450,000 in grants to supplement a new human trafficking task force. The main priority is the proper training of law enforcement. Efforts to identify and prosecute human traffickers are being stepped up. The 79 national convictions involving human trafficking in fiscal year 2006 were more than double the convictions the previous year. Utah had two of those convictions. With the success comes the knowledge that more needs to be done. A few different organizations focus on the victims of human trafficking. The International Rescue Committee, headquartered in New York City, has a refugee resettlement office in Salt Lake City. Victims of human trafficking usually arrive at the IRC after they have been found, rescued and stabalized. “Most of our work is to stabilize the refugee until the persecution has stopped and then get them resettled into the country,” said Patrick Poulin, resettlement director for the IRC in Salt Lake. “It’s important to establish protocols for helping victims once they’re rescued,” Rydalch said. A second organization is the Utah Health and Human Rights Project. The agency “promotes the health, dignity, and self-sufficiency of refugees, asylees, and immigrants who have endured severe human rights abuses, including torture, war-related trauma, and human trafficking,” according to the UHHP Web site. Catholic Community Services of Utah is another support group for refugees. CCS “provides comprehensive resettlement services to refugees from various regions of the world,” according to its Web site. All agencies need volunteers and donations. IRC Salt Lake City, for example, is seeking warm winter clothing, comforters, gift cards to local grocery stores and other items. The office also holds orientation sessions for individuals interested in volunteering.